Philomena Amesbury, Countess of Dunbridge, is young and full of spirit; she’s not about to let a little thing like the death of her husband keep her from traveling to America to take New York City by storm. No one’s going to call her a Dowager, she’s barely 26 years old, and of course, she didn’t expect to discover her host dead in the arms of his young mistress immediately upon her arrival. Or his wife, her childhood friend, accused of his murder. “She wasn’t the only one who wondered if somehow Bev had managed to kill her husband or arranged to have him killed. Everyone knew America was filled with gangsters ready to murder for payment.” And Lady Philomena certainly couldn’t have expected the infuriatingly honest, John Atkins, the strikingly handsome police detective of an especially corrupt precinct in charge of the investigation. Or the mysterious visitor who remains so temptingly elusive. From the decadence of high-society balls, to the swankiness of Belmont horse racing, murder and scandals abound. “Philomena had no love for Reggie Reynolds. Well, in truth she hardly knew the man, but it did seem that everyone was acting very cavalier about his death . . . Now, only a week into her American experience, what had originally appeared to be a suicide or a lover’s quarrel had grown to include a jealous wife, an angry father, and horse racing, which added a whole new world of possibilities from gambling debts to missing jockeys.” Someone simply must do something, and Countess Dunbridge is more than happy to oblige. Shelley Noble is the New York Times bestselling author of numerous women’s fiction works such as Lighthouse Beach (2018), The Beach at Painter’s Cove (2017), and Whisper Beach (2015). She is also the author of several amateur sleuth mystery series, written as Shelley Freydont. 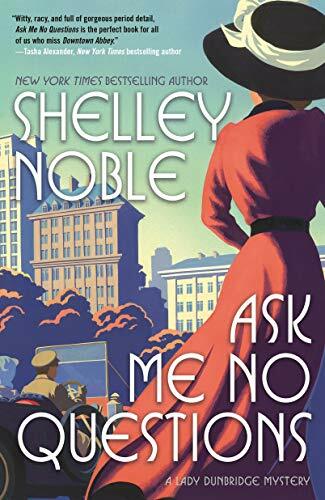 Noble’s newest escapade, Ask Me No Questions is a crafty historically set mystery that’s full of witty dialogue and playful romance. This first book in a new series makes a wonderful addition to the genre and pays homage to the great mystery sleuths of past generations. The author does a splendid job of creating credible historical atmosphere and the comically haughty descriptions of Manhattan high society are especially delightful. Overall, Ask Me No Questions is an outstanding read that’s full of delightful and amusing characters. Although the plot was a little bit cliché at times, it had just the right amount of twists and turns to stay entertaining. This is a great introduction to a new mystery series and highly recommended. Michael Thomas Barry is a staff reviewer at New York Journal of Books.